What is Power over Ethernet (PoE) and Do I Need It? 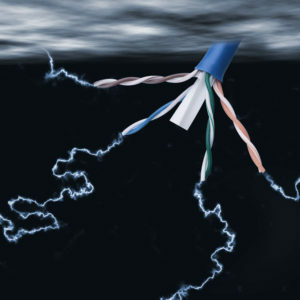 Power over Ethernet (PoE) is a standard that allows electrical power to be transmitted over your network using the same cables that transmit your network data. In order to take advantage of POE, first you must have a POE network switch. A POE switch can deliver power to attached devices. Many network attached devices, such as computers will not use the power, but some POE enabled peripheral devices such as wireless access points and VOIP phones can get all of their power via the POE enabled network. This allows you to discard those unsightly wall warts normally used to power peripheral network devices. PoE also avoids the problem of having a network port available, but no AC receptacle nearby. What is the difference between PoE and PoE+? PoE, which is covered by the 802.3af standard can supply up to 15.4 watts of power to a network attached device, whereas PoE+ (i.e. 802.3at) can supply 25.5 watts to a device. Whether you need the higher power of PoE depends on the power consumption of the devices you plan to use. Omni Cabling's Michigan Technology Integration Service Area Includes: Allen Park, Ann Arbor, Auburn Hills, Birmingham, Brownstown, Canton, Chesterfield, Clarkston, Clinton Township, Commerce Township, Dearborn, Detroit, Eastpointe, Farmington Hills, Ferndale, Garden City, Harrison Township, Livonia, Macomb Township, Madison Heights, Mount Clemens, Northville, Novi, Oak Park, Orion Township, Oxford, Plymouth, Pontiac, Port Huron, Redford, Rochester Hills, Romulus, Roseville, Royal Oak, Shelby Township, Southfield, St. Clair Shores, Sterling Heights, Taylor, Troy, Warren, Washington Township, Waterford, Westland, Walled Lake, and Wyandotte. MI counties include: Oakland, Wayne, Macomb, Monroe, Washtenaw, Jackson, Livingston, Lapeer, St. Clair, Huron, Tuscolo, Genesee, Shiawassee, Saginaw, Ingham, Jackson, Hillsdale, Eaton, and more. Omni Cabling + Technology Integration strives to offer the best data cabling, audio/video services, and home theaters. We do installation for office building, warehouse, corporate, business, commercial, non-profit, school, education, hospital, healthcare, places of worship, church, industrial, manufacturing facility, IT closet, IT room, server room, data center and more. Omni Cabling is a Commercial Integrator, Audio / Video Integrator, and Technology Integrator in Michigan. Omni Cabling Commercial AV Installer. Omni Cabling & Technology Integration is a fiber optic cabling provider, network data cabling, MI Data Cabling, access control system, RFID card + key fob reader lock installer, security camera, CCTV, single mode fiber, multi mode fiber, fiber optic fusion splicing company, LC and SC connectorization, indoor and outdoor fiber optic cabling, CAT5 cabling, CAT5E cabling, CAT6 cabling, structured cabling, av installer, audio video installer, network surveillance camera, and provider of many other technology integration services in Michigan and Ohio. For Michigan Commercial Furniture, Michigan Business Furniture, Michigan K-12 Education Furniture, Michigan University and College Furniture, Michigan Healthcare Furniture, check out our furniture division - Omni Tech Spaces.